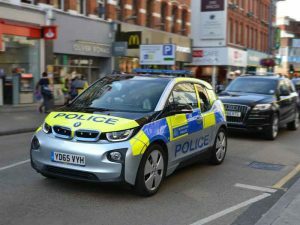 The London Metropolitan Police has begun a trial of a range-extended BMW i3 as a patrol car, with the aim of evaluating how electric vehicles could perform in a live operational environment. The new i3 is now on patrol in Wandsworth, and will respond to police incidents. In addition to the standard testing and evaluation tools, police officers will report back on their experience of using the vehicle during regular patrolling duties. Range-extended i3 models have a range of up to 100 miles for the 2017 model, assisted by regenerative braking technology, and can reach 0-30 mph in 3.5 seconds.